"Teaching students to value, encourage, and respect each other, therefore creating an open line of communication for all." but to create a culture of kindness. 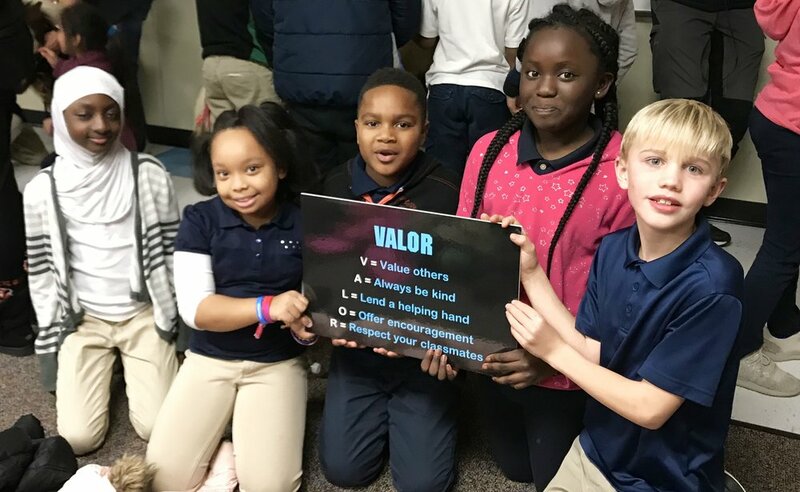 We discuss with students that they will encounter other children and adults that do not live by the acts of Valor and that they need to understand when that happens and what they can do to protect themselves or their peers. We provide information on what bullying is and how it is different from someone being rude or mean. A discussion is held that provides examples of the four basic types of bullying; social, verbal, physical and cyber. During this discussion the school resource officer talks about the legal implications of this type of behavior. At the conclusion of the presentation, the horses are brought in to meet and spend time with the children while handlers encourage conversation. We use the horses to remind students that the horses need to be trained with some of the same principals we talk about with Valor. Horses are especially tuned into how kind they are treated by humans and we explain that many of the ways that people like to be treated, horses do as well. When horses are valued, encouraged, and respected by humans they are often much more willing to interact. We are also thrilled to be able to partner with the Cincinnati Reds Baseball team in our efforts to put a stop to bullying. They will be providing gifts for the winners of our first annual poster contest and the winner will be announced at the Reds Family Opening Day on March 31st, 2018.